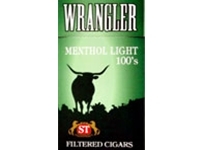 Wrangler Menthol lights Filtered Cigars have a special blending of cigar tobaccos that produces a distinctive Menthol light taste with a pleasant aroma and smooth finish. Each Wrangler Menthol lights Filtered Cigars is produced with a filter and wrapped in a natural tobacco leaf. Offered at a discount low price Wrangler makes it a great, affordable filtered cigar. Available in Box 100's and packaged 20 cigars per pack, 10 packs to a carton for a total of 200 premium filtered cigars.